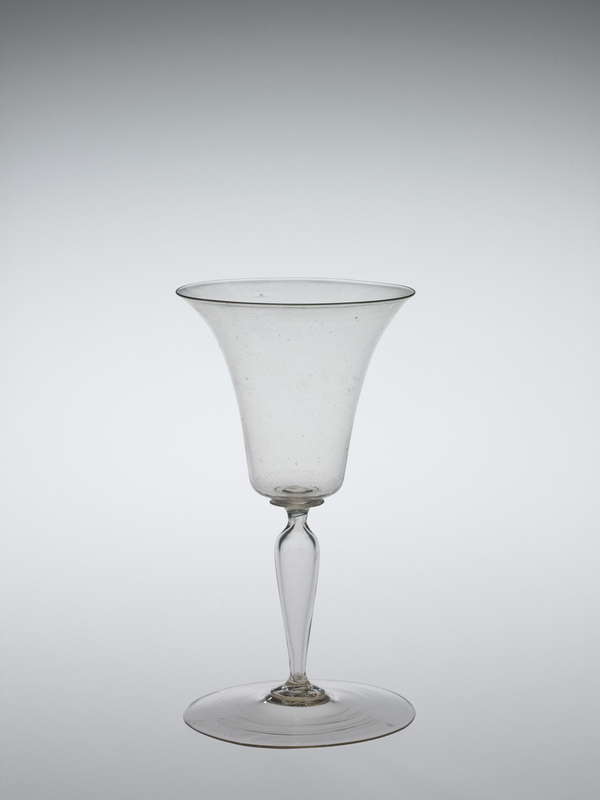 Built on the blowpipe, this goblet has a slight flare, one constriction in the stem, and a merese. This goblet will be made from three bubbles of glass. The first gather is going to become the vessel body. The blowpipe is held downward slightly to elongate the glass, and then the glass rolled back and forth on the marver to make certain that the gather is perfectly round and perfectly concentric with the blowpipe. Air is blown into the pipe, and a bubble is formed. The tip is left thick, and it’s marvered to make it pointed and to make it cool. After reheating, the process of forming the cup begins. A point is created at the center, a constriction or neck begun. The bubble is further inflated and suddenly elongated. The neck or constriction must be very small in diameter, and it must be fragile to break easily later in the process. The excess glass is trimmed from the end. The blowpipe is held downward during the reheat to taper the vessel body. The jacks are held on the side, air is blown into the pipe, and the lower half of the bubble is given its final shape. The bottom is flattened somewhat, and a small bit of glass freshly gathered from the furnace is added to the tip. This glass is then tooled to become a merese. The second bubble is gathered. This will become the stem. The bubble is constricted near its blowpipe, held down, and the bubble elongates and creates the natural teardrop shape of the stem. The bubble is cut free of its blowpipe, and after reheating, the uppermost part of the stem is tooled. The excess is trimmed free. Another merese is added—this time, to the tip of the stem. And the third bubble is lowered onto the merese, inflated further, and cut free of its blowpipe. This will become the foot. A constriction is made, and this will create a hole in the end of the bubble. Ultimately this will be the rim of the foot. The foot is reheated. Throughout the process, the entire goblet must be kept well over 1000 degrees Fahrenheit. The lowermost part of the stem is blown with the soffietta to keep it from softening during the subsequent reheat. The soffietta is used to inflate the foot bubble further. 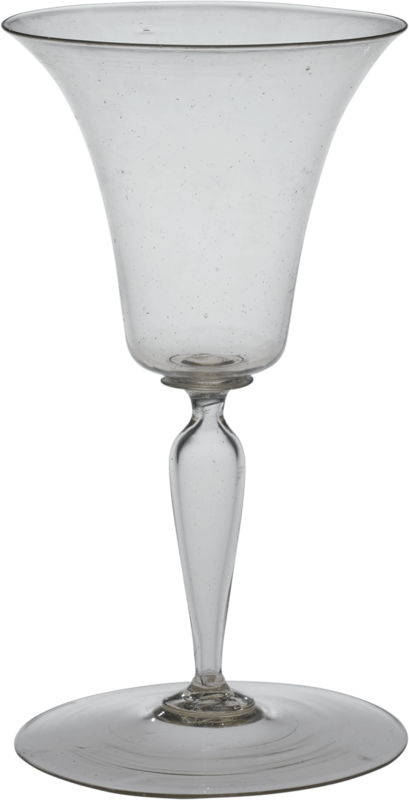 The glass is very thin, and it requires multiple reheats to give the foot its final shape. The goblet is transferred to a punty to allow the final shaping of the rim. 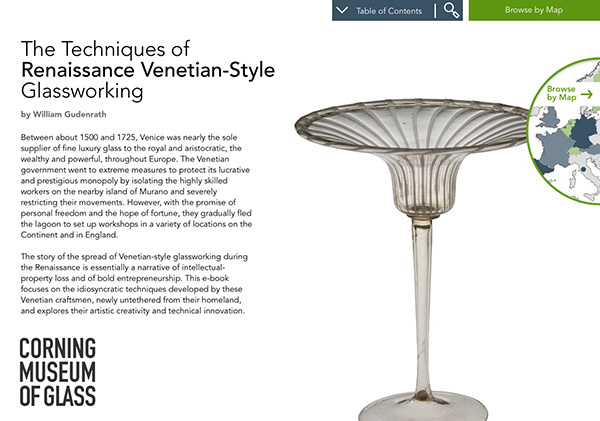 Sixteenth- and 17th-century Venetian wineglasses have exceedingly thin rims. This is achieved with a special rim-thinning procedure. The thick glass is pulled out, a new constriction is formed, and the thick glass is knocked free of the goblet. The edge is reheated, and the hole at the end opened to the diameter of about an inch. After reheating, the soffietta is used to shape the uppermost part of the vessel body. After the cup is made perfectly conical, a combination of reheating and tooling creates the gentle flare that we see in the original object.